On a ball screen, most players are good enough to beat their primary defender and finish. However, to be considered exceptional, players must also learn how to beat and finish against helpside defenders. All elite level players share this ability and mentality. Coach Jim Huber, probably one of the best basketball curriculum producers in the USA, has developed a competitive game drill that will boost confidence, fun, and results to master finishing over helpside defenders off of a ball screen. 1. Place two cones at the top of the key. The cones represent the feet of the screener. 2. Player 1 has the ball on offense and starts at half court. 3. Player 2 is on defense and starts opposite of Player 1 at the block. 4. The drill is initiated when Player 1 hard dribbles downhill, fakes one way then gets even with the cones (the use of the ball screen). 5. When Player 1 is dribbling downhill, Player 2 sprints to the opposite block then runs up to immediately help by contesting and defending Player 1. 6. If Player 1 scores, they stay on offense. 7. If Player 2 gets a stop, they then rotate and play offense. To effectively use a ball screen, players must set up their primary defender by getting them below the screen. Once a defender is caught on the screen, it is difficult to get out. If they do get out, the ball handler should go shoulder to shoulder with the screener, allowing no air space for the caught defender to escape. 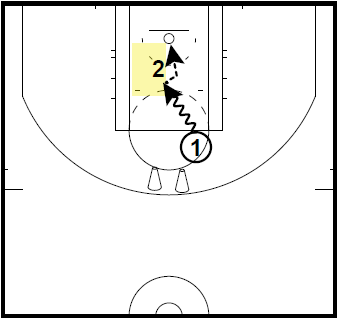 This leads to the primary defender getting beat and chasing from behind, leading to easy scoring opportunities for the screener. Think score! There are times when the right pass will be made to a rolling big or kick-out for an uncontested jump shot, but the first priority should be for the guard to score. Players ought to see the floor and locate the helpside defender as soon as they turn the corner off of a ball screen. Learning to read the helpside defender will lead to enhanced decision making and more scoring chances. 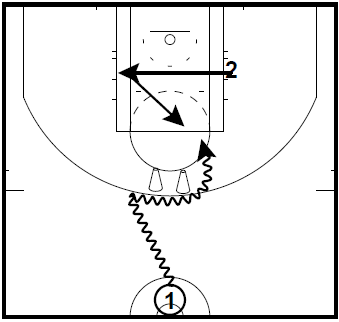 The ball handler must dribble below the cone level (that represents the feet of the screener). This is crucial as it sets up the foundation of the drill; First, beat the primary defender. Second, finish over the helpside defender. Be hard to guard. Place pressure on the helpside defender by being a dual threat: ready to pull up for a jumper or blow by for a finish at the basket. Implement a change of pace or probe dribble to throw off and disrupt the timing and position of the helpside defender, making it tough to read the ball handler's actions. Make It Competitive - Keep score and play short games to 3 or 4. Force the defense to get a stop before they can go on offense. Or force the offense to score to stay on the court. 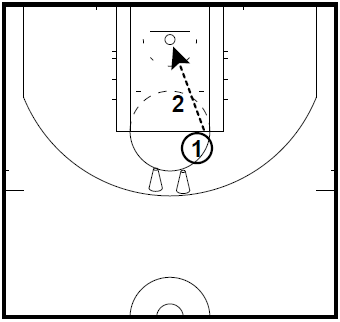 Change the angle of the ball screen to the sides and place the helpside defender in different positions. This will challenge the primary ball handler on their ability to make the most heads-up plays in different spots on the court. Add more players to the drill. A second offensive player can be added to teach the helpside defender how to help and recover. This creates a game-like situation to improve passing when the helpside defense stops the scorer. Support Assertiveness - Mistakes will be made in this drill, play through them and keep attacking. This is the only way to naturally learn what will harm or help a skillset. Multiple Players in the drill - If you have 5 or 6 players at a basket, use the offense to defense to off format. Players are sure to get lots of reps for improvement. Dribbles - Limit each player to 3 or 4 dribbles per possession, forcing them to be efficient with their dribble. Breakthrough Basketball Camps - Guard Play, Shooting, Youth, Ball Handling, and More. FREE Shooting Guide & Workouts. How is the euro finish not a travel? He picks up the ball with right foot, slides onto left foot then touches right foot again. Travel in any book I know. Please explain. Just kidding. It's really close and I can't tell very well. If he picked up the ball when his right foot was planted, then it was a travel. If he started to pick up the ball as he was stepping with his left foot, it's not a travel. But thanks for pointing that out. We probably should have used a different clip for better clarity with that example. Thanks for all the great drills. Thank you for all your helpful videos. you are doing a great service for all learning players.